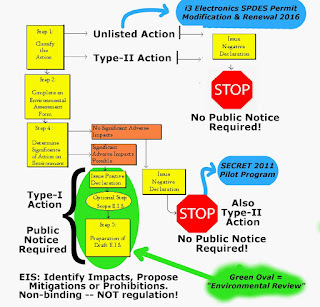 BillHustonBlog: New from DEC re: i3 Electronics SPDES renewal : SEQR info! New from DEC re: i3 Electronics SPDES renewal : SEQR info! COME TO THE PUBLIC HEARING! When: Wed, Sept 14th, 5pm. I hope you all got a copy of the new "enhanced" SEQR review from DEC yesterday. SEQRA in relation to the i3 Electronics, Inc SPDES permit. There are SEVERAL opportunities along the way to declare that there are "No Significant Impacts". This is NOT GOOD. It almost encourages DEC staff to NOT perform a full review. (getting to the Green Oval). Just watch the first 3 min. 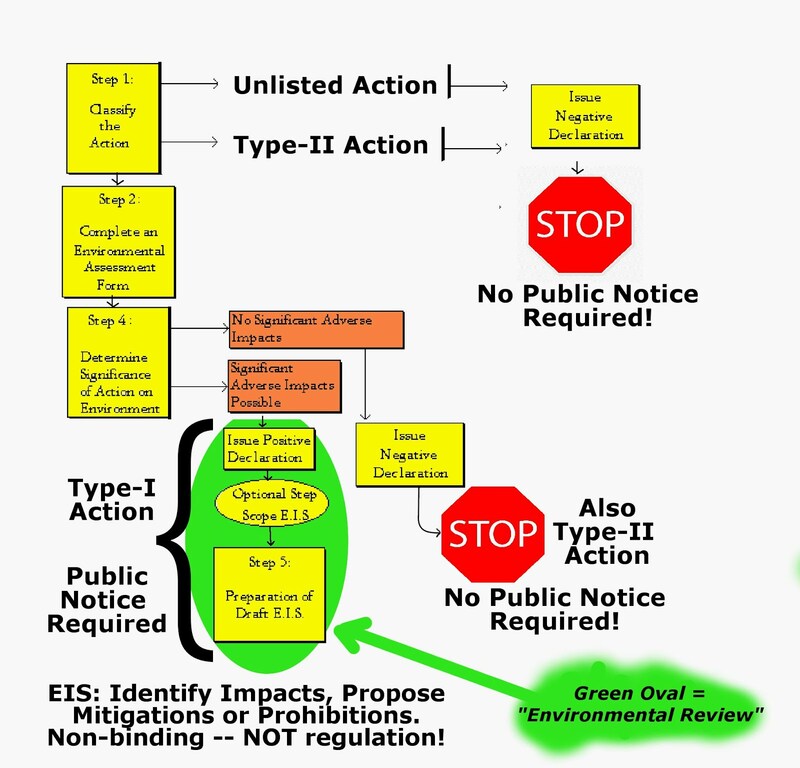 But we never get to this point if this is an "unlisted action" or a "Type-II action". ​It is the same as the first, only it also shows (blue highlight) that the original 2011 DEC Pilot program was a SECRET Type-II action, whereby some DEC administrator signed off on the statement "Finding of No Significant Impacts" WITHOUT an actual environmental review! Now the present hearing is for a SPDES renewal and modification is considered by the DEC to be of SUCH LOW CONSEQUENCE (think about something trivial, e.g., the Governor picking up a pen) that the DEC calls it an "unlisted action". Also interesting is that DEC tells us there are 9 leachate trucks per day, and 23 non-leachate trucks (but does not explain what these other trucks are for!). Only their numbers don't add up! They show the truck capacities as being "6,400 to 8,300 gallons", and we also know there is 80,000 gallons per day. Do the math: 80,000 gallons / 9 trucks is = 8,889 gallons in a truck, which is GREATER than the largest truck which DEC tells us about! In actual fact, we have seen 2 different sized trucks coming from Seneca Meadows. I have estimated them to be a) 5,600 gallons, and b) 8,000 gal. We know each truck makes 2 trips/day = 4 trucks from Seneca Meadows. We also know Broome County uses a smaller capacity truck, 5,600 gallons. = 13 or 14 trucks per day. = 36 or 37 trucks PER DAY just for the i3 WWTP. * 5 days/week = 180-185 trucks per week!!!! !